After many years wanting to start my very own hive, I'm finally taking the plunge and setting up my first urban hive in April. Rain is in the forecast starting on Sunday so we went by the site today before it got all muddy. There is a small excavator on site with a pile of some sort of fill material. Here is a shot of the the form for the retaining wall. Another angle of the wall. Akash was very excited to sit in the excavator. Here is a shot of behind the wall. Better shot of the excavator and fill material. I went by the site on Saturday and not a lot of additional work as been done since the footing were poured. Most likely, the concrete needed to cure before they could do additional work. Fun Fact: Concrete doesn’t “dry”; it’s actually an exothermic reaction between the water and cement that causes it to get hard. That architectural engineering degree from UT finally has paid off! So while there will most likely be work done during the week, here are some additional photos of the house as seen from the street. Here is a photo of the original house. One of main design considerations for this project was to respect the original footprint and incorporate some of the design elements from the original house. MF Architecture has done a fantastic job taking our requirements for our new house while respecting the original house and site location. I didn’t get a chance to make it out to watch them pour the concrete, but I swung by during my lunch hour to see finished product. The next steps should be wrapping up the walls and then prepping the site for the foundation slab for the house. The rain has stopped and work is progressing again. When I arrived on Saturday, I was greeted by this sign. I also noticed we had a new water meter box since our original one was crushed by the rig used to drive in the piles. 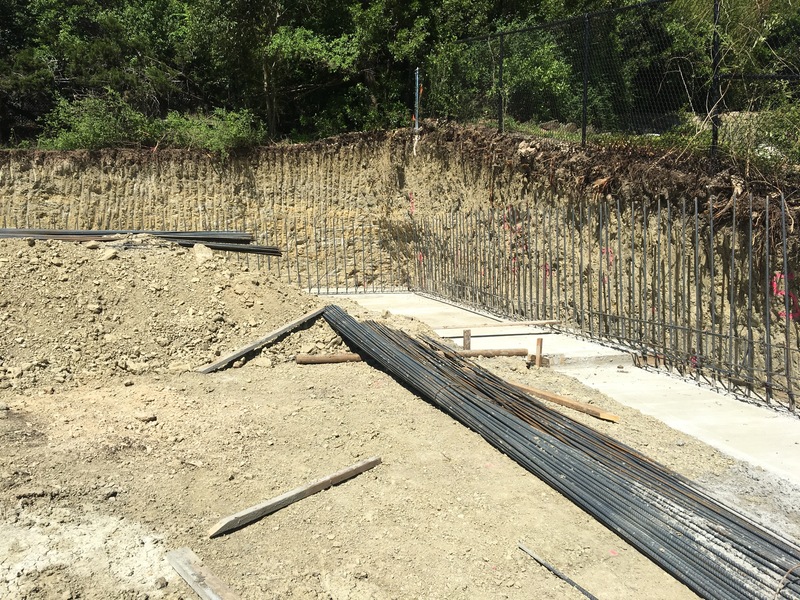 At the top of the site, all the structural steel for the retaining walls was almost complete. 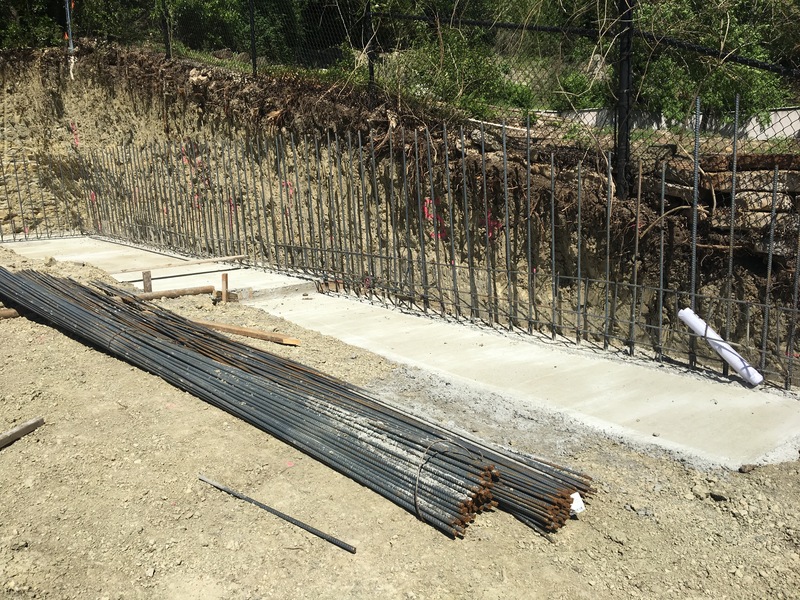 These will be some pretty beefy retaining walls since they are right up against our neighbors property line as well as along the back of the lot. There was a crew there finishing up all the steel, and they are on track to pour them on Monday. If I’m able, I may try and swing by and get some video of the pump truck pouring the footings. We’ve had rain for the past two weekends, and the property is a muddy mess. The site of the house is primarily clay which made walking up the hill to get some pictures a slippery adventure. We had so much mud on the bottom of our shoes that we had to take them off to drive home. It looks like they finished excavating the dirt up to our property line along the north edge of the property and on the west edge where the garage with roof top deck will eventually go with access to the upper tier of the yard. Luckily, the ten day forecast shows no rain and temperatures in the 70’s so hopefully it will dry out the site and allow work to prepare for the foundation pour. Once the concrete is on the ground, rain won’t be as limiting a factor to make progress. Nothing dramatic has happened since last week. The pile rig has been moved to the bottom of the site and excavating work continues. Unfortunately, there is rain in the forecast for the next week so depending on the severity, things could slow down until everything dries out. Today’s visit didn’t have a lot of excitement like last week, but it was nice to see all the piles in the ground and cut off at the proper height in preparation for the concrete foundation pour. 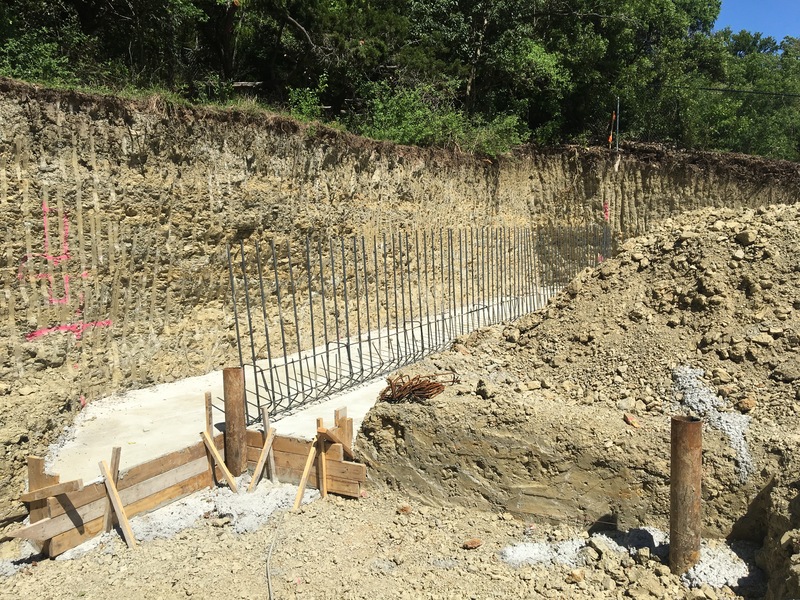 We met our builder there and they stated that most of the piles went down 20 feet 6 inches before hitting limestone with a handful hitting rock at 9 to 12 feet. Next steps will be to move some of the dirt around and prep the site for the concrete foundation pour. Unless we get any major weather, this should hopefully be completed in the next four weeks.